When I first got to know this William Larue Weller, albeit the 2012 release, I loved it immediately and went looking for another sample. WhiskyGorillaz was the place to be. This WLW was distilled in the summer of 1998 and bottled in 2012, hence making this a 12 Year Old. The nose is nicely creamy on honey, caramel, vanilla and cinnamon, brown sugar and coconut. Some marzipan and a nice hint of Maraschino cherries and even some raspberry. Quite a bit of mint, which gets enhanced if you add some water, which also brings out pine cones. Special! It is creamy and spicy on the palate. Brown sugar, making it a bit rum-like, hints of coffee and chocolate, dark fruit, both marinated and dried. A touch of pine tree sap and a lightly bitter hint of tannins. Diluted, that bitterness is subdued and the sweetness emphasized, which I think is a plus. The long finish allows the tannins to speak again, making it fairly drying. You can avoid this by adding some water. This one is good, but much better with a splash of water. You can find it here and there for around 150 EUR. Nose: You can smell the wheat, like buttered wheat crackers, creamy and buttery corn, cooked vinilla, some burnt sugars and supermarket marshmallow's melted over a fire. Palate: Big and Powerful (it is 63.% alc) but not too hot. Big notes of creamy vinilla, creamy latte, lovely note of buttery wheat crackers, piny and spicy notes. Finish: Very long, cooked vinilla, buttery wheat crackers, some spices, prickly on the tongue and left my mouth watering, creamy. I thought this was a fantastic bourbon, some other wheat heavy bourbons I've had have tasted a little too mellow for there own good. This problem does not present itself here, this is a powerful and robust whisky that would be a treat to bourbon fans everywhere. Great Stuff. sounds nice! I'm a fan of old(er) wheated bourbons. Must add this one to my list! Ok, I don't submit many reviews here. But when I do write a review, it's because I've just sampled a spectacular whiskey and I just gotta share. Either spectacularly bad (like AZ High Spirits Mesquite) or spectacularly good (like Macallan Signatory 20). Well, this review falls into the latter category. Now, for full disclosure: I'm still learning Bourbon. I understand single malt Scotch pretty well, and I'm not too bad with Irish's. But I'm still learning Bourbon. (Don't get me started on Tennessee sour mash's). Nonetheless, I do consider myself a bonafide student of whisk(e)y, and can identify a gem when I see (nose/taste) one. I've added bourbons to my personal collection as "homework". Let the grading begin! So, with that in mind, let's commence. WL Weller is part of Buffalo Trace's "Antique Collection". As near as I can tell, this is about 13yo (give or take a couple of months), 2010 vintage. I'm not a big fan of typical Buffalo Trace, but perhaps that's because I'm not a fan of their "budget labels" you get in the local grocery store. Will a $160 "connoisseur’s label" be worthwhile to my discriminating palate? The nose: malt extract, chocolate fudge, cherry juice. Maybe some fruitcake. Hmm, the karo syrup note, so typical of cheap bourbon, is balanced here. Must be the wheat in the mashbill. The palate: extremely oily & buttery, perhaps the most viscous whiskey I've yet sampled. Mmmm, I adore viscous/oily scotches, so I approve. I don't faint around feints! The nose is replicated: dark chocolate-covered black cherry cordials. The sticky white goop in the cordials is the bourbon corn sweetness! It is not off-putting. The EtOH burn goes great with the flavors. For those familiar with my other reviews, then you know I give extra credit points for whisk(e)ies that elicit memories from me. In this case, I get memories of my grandfather ordering his beloved Manhattan. He died a few years back; I do miss him. WL Weller, thank you for reminding me how much I miss Grandpa! 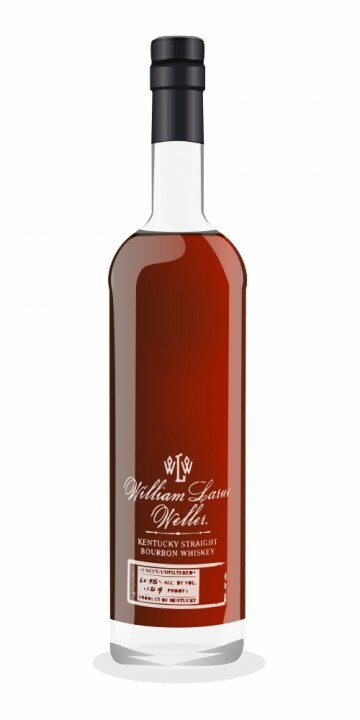 @Wills, in the US, William Larue Weller is not insanely expensive, usually $ 65 to $ 90, but it is extremely scarce, and usually pre-reserved. Taste it and find out why it is so scarce. This, by the way, is a WHEATED bourbon, which is to say, one of the only about 5 % of bourbons made with wheat instead of rye, as the "flavoring grain". Bourbon is 51% minimum from corn, and usually in excess of 70% corn, but you won't be tasting corn here, except for the body and a bit of texture. You will taste only wheat flavours, new wood flavours, and a 'bit' of the 63% abv. Nose: Total banana-bread goodness. Dark chocolate truffle, burnt marshmallow, corn candy, honey and ginger. Just a festival of sweet indulgence, yet underneath there's a level of complexity that really confirms this bourbon as the rolls royce of its league. Eucaplyptus, wet cardboard, fresh paint, wood sap, and kahlua-infused coffee. Sumptuous. Taste: A big oak wave of spice to wake the senses. Leather, tobacco smoke, raw yellow pepper and jalapeño sting. And as if in reverse of the proceedings on the nose, this beautiful layer of spice is underpinned by a sweet bed of caramel, banana sherbet, mocha, mint chocolate, almonds and burnt marshmallow. This is bourbon at its complex best, operating very much on a world-class level. Finish: Long and expansive with a chilli-spice kick. All sorts of new flavours also coming to the fore - raw courgette, cold cigar smoke, date paste, aniseed spice, strawberry liquorice, burnt caramel and salted almonds. Balance: Despite its high strength and immensely dense flavour profile, it's actually quite light-bodied and even refreshing. There's a lot of wonderful facets to its character that can be endlessly explored upon each new sip, and the invigorating spice kick is both entertaining and complex within itself, as there is a subtlety and layered quality to the Weller spice. This is a truly great bourbon that has everything, almost combining all the best elements of a great corn whiskey, as well of those of rye whiskey. Exceptional. Thank you for your very in depth analysis as always @Victor! As ever much to learn, especially from someone with as much knowledge and experience of rye and bourbon as you - cheers to Connosr for giving the platform to share all that knowledge! This is third post featuring bottles from the B.Trace Antique collection bottle share organized by Sjoerd. Nose : cloves, vanilla and cinnamon spice with some perfumed oak. Candy, maple and also some tobacco leaves. Palate: Rich thick syrup,maple , some big coconut!! espresso , tobacco, sultanas , and spice. Hot. and very very complex. Wheat is great! Finish: toffee, vanilla, moist oak. This is a Cracking dram. no less. the best I’ve had so far from the Buffalo Trace Antique collection. It’s well integrated, complex, sweet, and maple-y, without being much. It’s intensely good, and very elegant. Splendid stuff. Splendid. One word : Buy. especially in the US where it’s so much cheaper. I’d get a few of those to keep. I just added my review of this lovely dram. I agree: a keeper. @PDD nice review mate. happy you enjoyed it as much as I did. William Larue Weller is considered to be an early pioneer in the Kentucky Bourbon business. He has been credited with being the first to use wheat in the mash bill (recipe) instead of rye. This is a wheated Bourbon, distilled in 1998 and from what I am reading, was aged in two different warehouses on floors 4 and 11 (plenty of summer heat on that upper floor). Tasted for review with a 12 oz. snifter, first neat and next with a splash of spring water, hand warmed and nosed, sipped for 45+ minutes. Nose: Light oak in the background while spicy, cinnamon vanilla on top delivers a nice ethanol enhanced punch with ripe fruit, sweet toffee cream. With a few drops of H2O it opens to reveal cotton candy, hint of tobacco. Palate: Sweet and ripe fruit with a up front burn that gracefully gives way to spice and a sophisticated sweet dry edge. With water it seems more oily, caramel topping. Wow, so good. Finish: Alcohol lingers with hint of tobacco, dry yet well balanced sweet wetness. The water provides a slightly more taste of the oak but still well mingled with all the disclosed flavors. Balance: This is some experience for this novice. My first real tasting of a cask strength Bourbon with such a high alcohol content but seems to be so mellow yet complex and smooth while playful with water. What a wonderfully well balanced and complex whiskey. I have done myself a favor in advancing my whiskey knowledge by having this bottle in my collection and believe others who enjoy Bourbon and/or whiskey would be well served to try this "well done" polished beauty. Surely something I would like to try. Thank you for your review. I have read many of your reviews and though we have different taste profiles, you seem to know alot about mashbills, etc. Do you happen to know if this is the same mashbill as the Van Winkle's? Like, I know its a wheater like the others i have mentioned, but it seems really really similar to the Van Winkles. Sure its younger, and it is at a much higher proof, but it seems really familiar to me. I also know that Buffalo trace now owns the Pappy recipe, and that Pappy (one of them anyways)worked for William Larue Weller as a salesman or something. So after putting all those pieces together I have this hunch that maybe they are the same mashbill/recipe as they build their stock of the Buffalo Trace produced Van Winkle's and the name is a clue to the history. Do you think there is anything to that? Thanks, and by the way, I appreciate all of your contributions. I only cussed you once when I tried the Buffalo Trace White Dog Mash you gave an 85. That ruined my day. @dbk, I think that you are completely correct, that, despite multiple variables about which we are never likely to have complete and accurate information affecting the flavours of a whisk(e)y, that it is entirely possible that some future greater-than-the-sum-of-its-parts whole may be fabricated from entirely new ingredients and industrial processes, that may succeed in doing a fair approximation of a previously produced, no longer available whiskey, such as the Stitzel-Weller Pappy Van Winkle 15. Nowadays I buy bottles of the Buffalo Trace-distilled 'new 15' largely to see whether the flavour profile of the new product is moving in the direction of Stitzel-Weller Pappy Van Winkle 15. New 15 very good bourbon in its own right, of course, but the Stitzel-Weller Pappy Van Winkle 15 is still by far my favourite wheater. William Larue Weller remains excellent, of course, as does Parkers Heritage Collection Wheated, but they are for me for very different moods than the Pappy Van Winkle 15. For me, a glass of Stitzel-Weller Pappy Van Winkle 15 is the American whiskey equivalent of popping a bottle of Champagne. Light, celebratory, intoxicating before taking a sip. Nose: Strong vanilla note, not just any vanilla, high quality Mexican vanilla, rich and fragrant. Creme brûlée, a hint of coffee, molasses, butter and brown sugar, like freshly made cookie dough. Palate: Strong, creamy, and thick. Wow, so many of the flavors in the nose are present on the palate. The mouthfeel is amazingly powerful and the arrival is so rich that it makes me feel as though I'm chewing on a square of chewy caramel. Finish: It evolves in and out of mild dryness and sweetness and eventually settles on vanilla. Delicious. I really couldn't say enough good things about this bourbon. Unfortunately, it seems as though the William Larue Weller gets lost behind the Sazerac 18 and George T. Stagg. Do yourself a favor and get this at least once. It's such a sweet and luscious bourbon while somehow not being cloying in the least. I can honestly say that this is the best bourbon to date that I have tried and is absolutely one of the best whiskies I have tried. As Ralfy says, great whisky continues developing and leaves you behind. This is one of those. @Dellnola, yes sir, you are totally right. William Larue Weller completely redefines the possibilities of wheated bourbon. This is high-test, knock your socks off wheated bourbon. It is totally delicious and there is nothing like it. The closest would be the Weller Antique 107 proof from 3 years ago, but it is still not to these same heights. Jim Murray knew what he was doing in naming this whiskey the "2011 Third Finest Whiskey in the World". I will probably also soon be putting in my own review of this, at a similar numerical rating. This is one of my top five favourites among all whisk(e)ys. I already have my order in for a case (3) for the 2011 release.